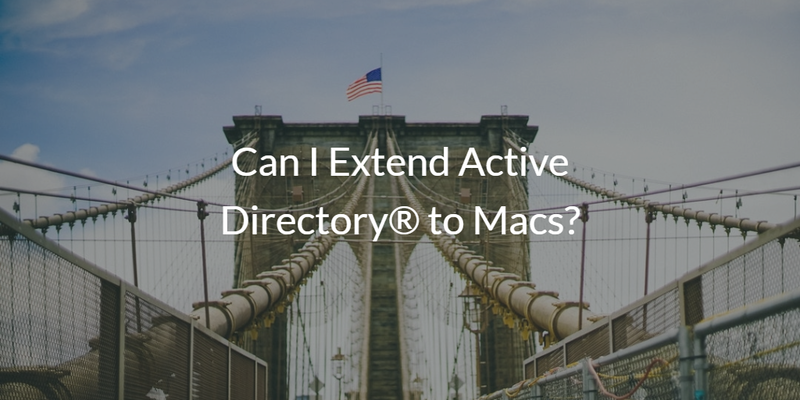 Can I Extend Active Directory® to Macs? Home » Blog » Can I Extend Active Directory® to Macs? Apple’s resurgence has Mac machines leading the way as one of the most popular laptops on the planet. But with their rise in popularity comes a challenge for IT admins. Macs and their users have traditionally been difficult to manage, and have generally ended up being manually managed. 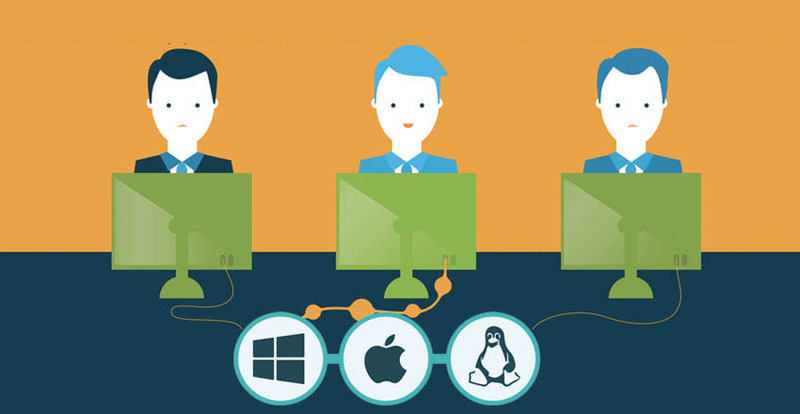 Often, in order to solve Mac management and centralize their directory, IT admins have wondered if they can extend Active Directory® to their Mac machines. The reason that admins have been interested in connecting Mac systems with Microsoft AD is because Active Directory is the most popular on-prem directory service. You could say that AD owns the market with a purported 95%+ market share with Fortune 1000 companies (adaxes). For many companies, AD is the backbone of their infrastructure. But, while AD may own controlling and managing Microsoft Windows machines and users, it struggles with non-Windows IT resources such as Macs. Today’s IT environment is shifting. The world isn’t on-prem and Windows specific anymore. The challenge with this shift though, as mentioned, is that AD has been a fixture for many organizations and it isn’t easy to replace. So, how do IT organizations embrace their users’ desires to use Mac machines, while still maintaining the ability to control user access and the device? Replacing Active Directory is possible – but not always ideal for every organization. While the benefits of switching to a modern directory or starting fresh with a innovative cloud-based directory can be tremendous, there are many organizations that have AD too ingrained in their organization to take either of these steps. Unfortunately for those locked into AD, while it has the ability to manage user access to Macs, it is difficult at best. The capabilities are limited and it doesn’t give IT admins full control in the way that they have with Windows devices through tools like GPOs. However, a new generation of technology is creating a cloud identity bridge from Active Directory to non-Windows IT resources, including Macs, Linux devices, AWS, G Suite, Google Cloud Platform, and much more. This identity bridge enables IT admins to leverage their existing AD instance as the core identity provider, while federating those identities to a cloud identity bridge which subsequently controls access to Macs. The benefit for IT admins is that they get a core identity for each user within AD, and they can still control access across a wide range of solutions leveraging their existing AD instance. IT admins simply connect Directory-as-a-Service® with AD, and identities are shared to the cloud identity provider. Any updates within AD are automatically reflected within the cloud directory and subsequently on the Mac device. This setup enables easy Mac management through Active Directory, in addition to many other services like cloud applications and servers, wireless networks, or even Linux machines. 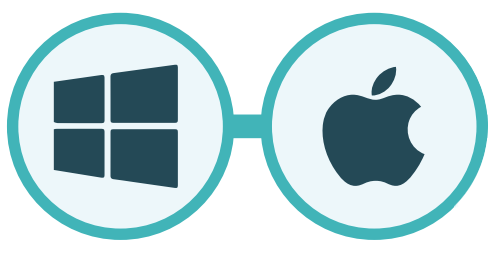 If you would like to learn more about an easier way to extend Active Directory to Macs, reach out to us. We would be happy to talk with you to help explain the process, and figure out if the AD Bridge could work for you. You can also check out the DaaS platform for yourself by signing up for a free account. Your first 10 users are free forever, so you can run an unlimited amount of tests to make sure that the bridge will work for you. 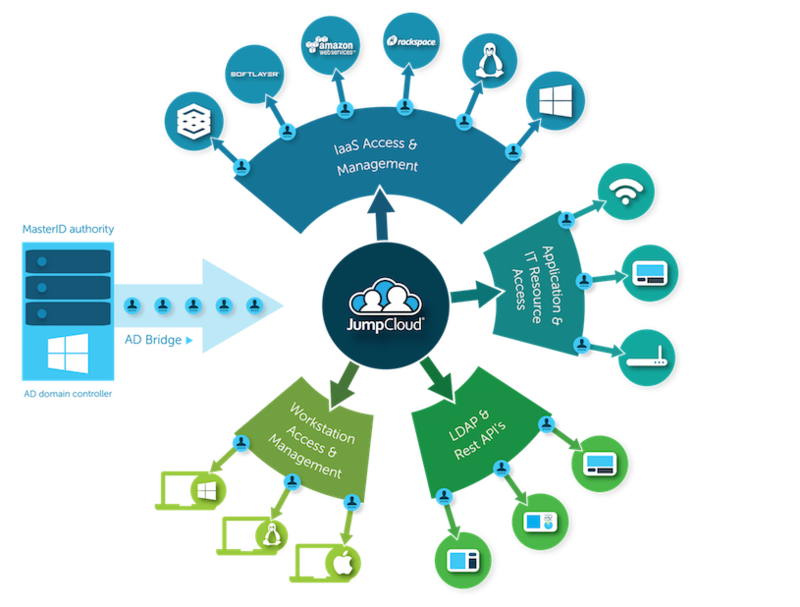 Alternatively, you can sign up for our JumpStart program to demo the product for an unlimited number of users, for a limited amount of time. This way, you can truly demo the product for your organization at full size. Extend Active Directory, and see for yourself how IT admins can regain control over IT resources.